The team is using a Hustler vertical attached to a railing on the stern of the Braveheart, and should be on bands 40 – 10M. 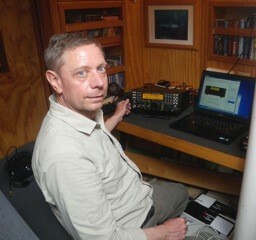 Dave, K3EL operating maritime mobile on the Braveheart. 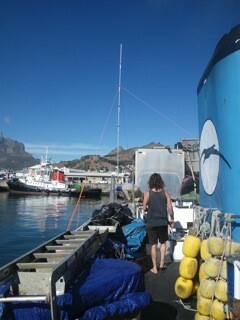 Please QSL to the QRZ address for all maritime mobile QSO’s. Finally, the Band Plan has been posted in the Plans section. It is only the band plan for when we are on the air at the same time as FT4JA. We have worked to ensure that our pileups do not overlap. Since we will be on the air for about 10 days before FT4JA hits the air – we expect the band plan might start out differently, but I will let everyone know as soon as I have that plan. Just an FYI, the Track Us function does not seem to be working. No updates for over 8 hours. The last update I see is for 4:37 a.m. and I have been checking regularly since then. I’ll check with the team and see whats happening. FYI, the Track Us function doesn’t appear to be working anymore. I have been checking regularly all day. The last update is still at 4:37 a.m. No changes on my end.